When we have friends over for dinner, my mood always decides what treats I bring to the table. 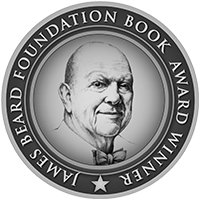 There are two options, I either feel like a sumptuous meal with several courses which might mean cooking for one or two days and which definitely requires good organisation before and on the night and most importantly enough time to enjoy all the preparations. 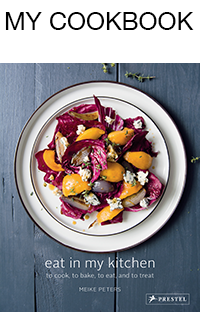 The other approach is to take it easy and choose recipes which don’t need a rigid plan. I just fill the table with plates full of food before or as our friends arrive and we all enjoy the night together. Eating, talking and laughing, drinking some wine of course, savoring and emptying the plates for hours. This was my choice when I had a dinner for 10 ahead of me a few days ago! Some of our friends from Malta just moved to Berlin a few months ago. I know how much Maltese love and miss their home and food when they live abroad so I decided to make a traditional Maltese recipe, zucchini stuffed with lemon ricotta. I would have loved to get the small round courgette (Qarabaghli in Maltese) which would have been perfect for this recipe as you can close the stuffed fruit from the top. 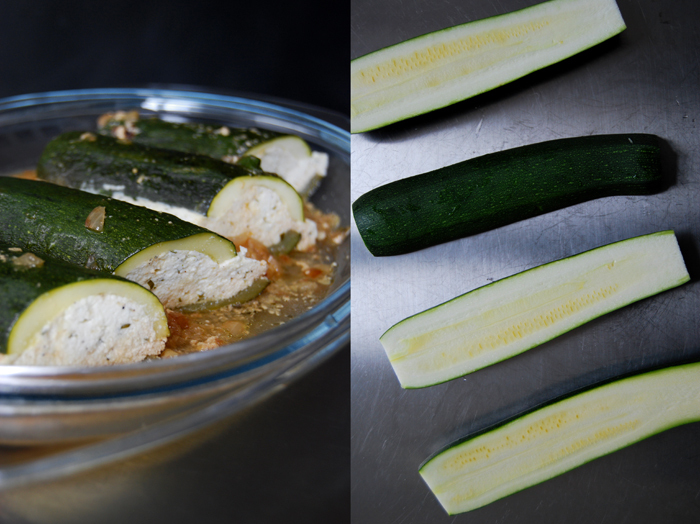 I worried that the ricotta would run down the sides of my long zucchini when I closed them but it worked fine. I cooked them for an hour in white wine together with the fried pulp of the fruits and some onions. Just a little of the creamy cheese went into the sauce and added some nice creaminess. In the late afternoon, I cooked the zucchinis and left them al dente. I didn’t want them to turn soggy as I had to warm them up again before our guests arrived. I filled my dining table with three different kinds of quiche which are very easy to prepare in advance and I can’t really say if I prefer them warm or cold (here’s one of my recipes). Two loaves of homemade bread and a big batch of my raspberry chocolate brownies were on my list as well, both are great nibbles for a long night. When we all gathered around the table and I brought the dish with the steaming zucchini I didn’t know that the night would go on for so long – our last guests left at 5 in the morning or so I was told, I fell asleep on the sofa at 4! Whisk the ricotta together with the parmesan, eggs, basil, lemon zest, salt and pepper. 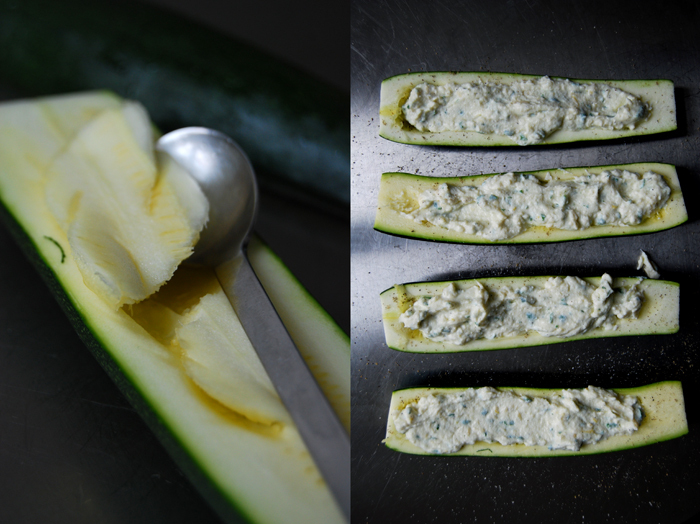 Scrape the pulp out of the zucchini with a small spoon and set aside. 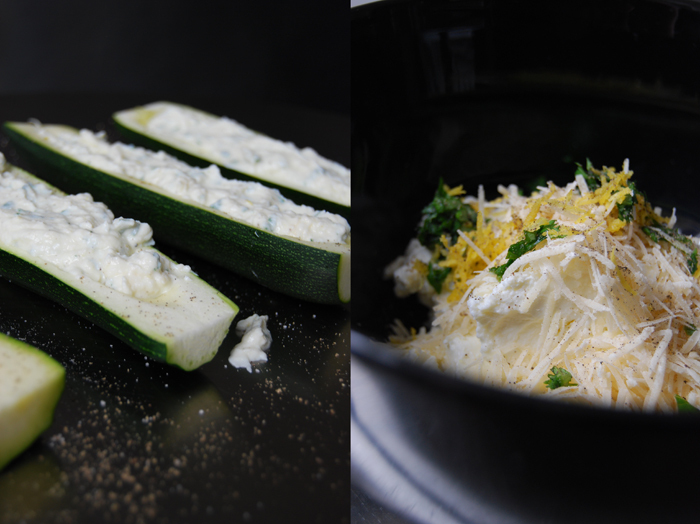 Season the inside of the zucchini with a little salt and pepper and fill both sides with the ricotta mixture. Close them just before you put them into the casserole. In a large pot or casserole with a lid (big enough for the zucchinis), fry the onions in a little oil till golden and soft on medium heat. Add the garlic and the pulp and fry for 2-3 minutes, deglaze with some white wine and add the sprigs of parsley. Put the stuffed zucchini on top of the onions, add some more wine (1-2cm / 1/2-1″ of the bottom should be covered), close with a lid and cook for 1 hour on low – medium heat. Check after 2o minutes, you may have to add some more wine, the bottom should remain covered. When the zucchinis are soft at the bottom and al dente at the top, take them out with 2 spatulas, carefully, and set them aside. Take out the parsley, add the tomato paste to the sauce and season with salt and pepper to taste. Serve the zucchini together with the sauce.